SHWE Field Development Project, Myanmar. Trenching and Backfilling of 2669m that includes Shore approach and 300m rock trench. Remote Project location with communication and logistic constraints. Working under tidal conditions. 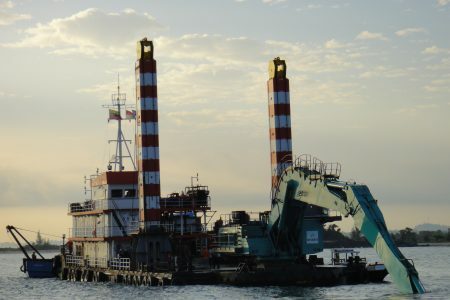 DDIL deploys Cutter Suction Dredger Dharti XI, Backhoe Dredger Dharti XXIV and Hopper Barges. •Obtaining permissions for drilling and blasting operations using explosives, including importation of Explosives, as per Guidelines of MoD, Myanmar. •Rock trenching by Backhoe Dredger Dharti XXIV and Hopper Barges for dumping of dredged rock. •Soft soil sections trenched with Cutter Suction Dredger Dharti XI and trenched material side-casted at a distance of approx. 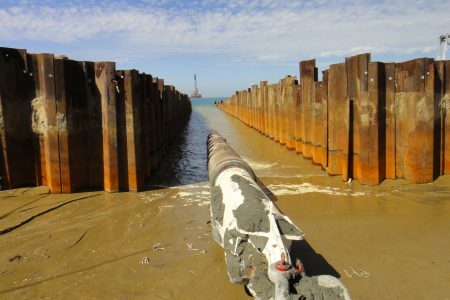 100~150m by floating Pipelines / rain bowing, depending on currents and permissions. 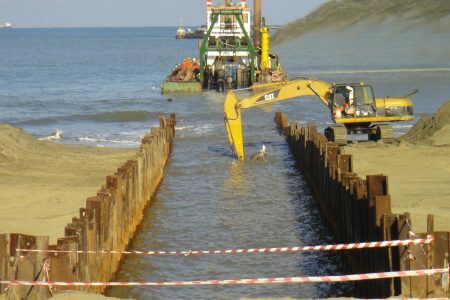 •Construction of Cofferdam with sheet piles for about 150m in the inter-tidal zone. •Cutter Suction Dredger Dharti X deployed to trench close to the end of Cofferdam, very near to the shore line. 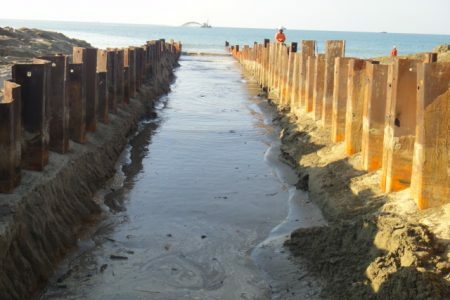 •Land based excavators used to excavate the material near shore and within the Cofferdam. •Daily surveys were carried out using survey boat equipped with Multi beam echo sounder to monitor trenching operations..
•All dredgers equipped with online monitoring systems to monitor the alignment of trench and progress of depth and bottom width. DDIL completes project in compliance with QHSE.